Conceptualized by Confederation of Indian Industry better known as CII to give impetus to night tourism during monsoon, fifth edition of Jaipur By Nite recently concluded at the City Palace, Jaipur. Rajasthan Tourism organized Jaipur By Night. The festival consisted of live music performances, Jaipur Women’s Car Rally, Jaipur by Nite Marathon and a food festival – The Bite Fest. I attended only event on day three. Venue of The Bite Fest and music concert couldn’t be better. Jaipur City Palace ranks among top five tourist attractions in Jaipur. 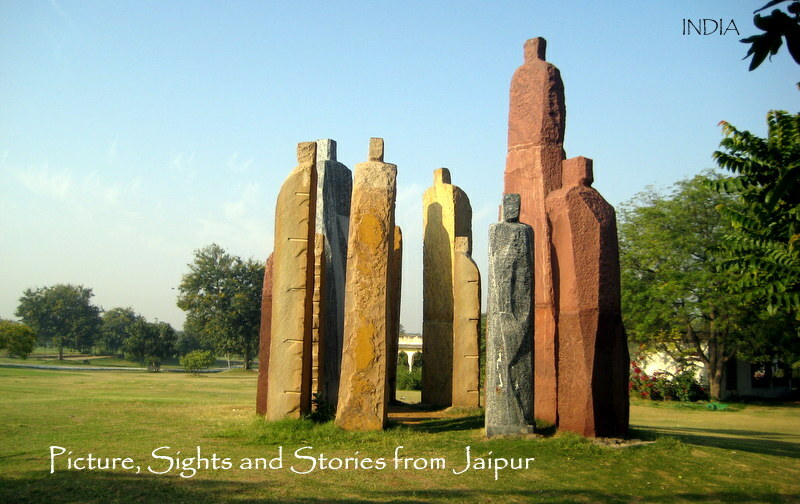 Therefore it is logical to host this event at one of the premiere tourist attraction of Jaipur. City Palace Jaipur is a royal abode. This is where Jaipur royalty has continued to live for close to 3 centuries! Only few sections of City Palace in Jaipur are open for the tourists. The music concert and Bite Fest took place in the courtyard of Mubarak Mahal. Let me take you through the photo journey. Don’t forget to check out the music videos of Swaraag Band if you love Rajasthani Folk songs and Indo-western Fusion music. Entry to the food festival & live music performance was from the gate near Jantar Mantar. We were greeted with the sight of Mubarak Mahal. Mubarak Mahal constructed with white marble in 1890 AD looked completely different in yellow light. The word Mubarak implies greeting.Built as a reception center & guest house, it’s a textile museum now. Like Albert hall museum, Mubarak Mahal is built in Indo-Sarascenic architectural style. Windows and Jharokhas give it a different look. One of these art installations looked out-of-place. While turban is symbol of Rajasthan, there was nothing Rajasthani about the other one! Food festival had food stalls of popular cafe, restaurants & food joints of Jaipur. Many Rajasthani elements were added in seating space to give it a differentiated look. Chokhi Dhani is a popular tourist destination in Jaipur providing setting and cuisine of ethnic Rajasthani village . Their food stall was a complete let down going by the menu. There was a good mix of variety in terms of food joints. We ordered Delhi Masala from Fat Lulu’s Pizza. The pizza tasted amazing! This prompted us to order another one – Queens! Delhi Masala Pizza by Fat Lulu’s. Unfortunately, the folks at Fat Lulu’s delivered our pizza to some other customer. In a haste to deliver our pizza faster, they burned the pizza! When we asked for an explanation, the staff found nothing wrong with this pizza. We didn’t want to waste our time by arguing or calling for the manager, so we ate what we could! Not a good review Fat Lulu’s!! You didn’t win any brownie point! We decided to try Kashmiri food at Zarpar, a newly opened Kashmiri restaurant in Jaipur. We ordered Rajma Chawal since Zarpar had only two offerings for the vegetarians. Did we have a choice? Frankly, Rajmah Chawal was far from good. It was just okay in terms of taste. What bothered me the most was smell of a non vegetarian food in Rajmah Chawal! I don’t think it was acceptable by any standard! With two fiasco’s we decided to avoid any more trials. We headed towards the Indo western fusion music performance by Swaraag band. The band played interesting and popular Rajasthani Folk songs in fusion performance. Watch Kesariya Balam Padharo Mhare Desh live performance video. Another popular sufi song Piya Re Piya Re originally sung by Nusrat Fateh Ali Khan was presented in a fusion style by Sawraag band. Watch sufi song Piya Re Piya Re live performance video. There weren’t many foreign tourists in Jaipur By Nite’s Bite Fest. Few tourists who attended Jaipur by Nite music performance thoroughly enjoyed the atmosphere. Have a look at these two videos. We also explored other areas of Jaipur City Palace specially lit for this festival – Rajendra Pol, Sarbato Bhadra Chowk and Diwan i Khaas. Rajendra Pol in Jaipur City Palace is probably one of the finest masterpieces of Rajput architecture. The gate is incredibly beautiful with fine carvings and workmanship, flanked by two white marble elephants on both sides. Diwan i Khas in Sarbato Bhadra Chowk. Don’t you think Diwan i Aam looks incredibly beautiful during night? I switched to manual setting of my smartphone to capture this picture. Another perspective of Diwan i Aam in Sarbato Bhadra Chowk. Here’s how I sum up my experience at Jaipur By Nite. Idea of food festival is a great concept. In terms of implementation, the choice of food partners – food joints and restaurants were not attractive for the foreign tourists. There was no local food experience for the tourists. The seating was limited considering the crowd. Around 10 PM marathoners invaded the venue leaving little space for everyone. Food options too were limited. Tourists were missing completely. Considering the motive of this event it was not marketed and promoted enough among the tourists. I’m hoping that the next version of Food Bite will be better than this one. Food is like a love and hate relationship, Pradita. Very rarely you come across good food. So true. I too am very iffy about places. I either love them or hate them. Wow!! Sooo eye-catching pics with a smart phone. Great job, love your post and also non biased review about rajma chawal😊😊, love your fairness. Keep it up!! In Hindi, shaabas. What a visual and gastronomical treat this is Arv! I have a friend going to Jaipur for a wedding and have asked her to check out your blog before she goes. Thanks Sandhya for recommending. I don’t think this is an exhaustive blog since I write what I feel like and with whatever time I manage to get. I wish I could write more… it’s time consuming! Fantastic post. So informative. Sharing on FB. Previous Previous post: Morning Be Like This?